How can we do more to enable residents and local volunteers to transform their communities for the better? At Local Trust, we've seen the incredible impact that can follow when residents and local volunteers are supported to take the lead- and we know that we're not alone. 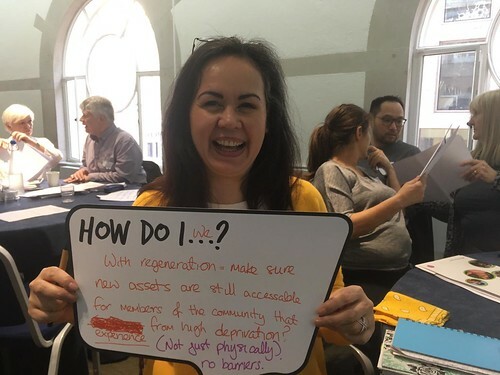 So this June, Local Trust hosted a roundtable discussion at the RSA to explore the best ways of enabling residents and local volunteers to transform their communities. Attendees included people involved in Big Local, academics, and voluntary and public sector professionals. The discussions brought together everyone's knowledge and experience of the best way to deliver support to local volunteers. The group also shared approaches for understanding and addressing the challenges that can arise. We've published a summary of the event, so that everyone can benefit from the insights. We must create opportunities for resident control in communities: There is a real opportunity to uncover residents’ latent desire to help their neighbours and community, but people want varying levels of control and influence and this has to be understood. It’s important to listen to people, and to have a spectrum of ways for residents to become involved, recognising that people respond to different approaches. We must support residents and local volunteers to build the confidence and skills to improve their community: Confidence plays an important role in helping people to have more control over what happens in their community. Often, people want to be more in control but don’t know how. Residents can find that organisations come in and provide communities with things they don’t need; it’s a lack of listening that is unhelpful. Sometimes it takes time to get to the bottom of residents’ feeling of powerlessness and apathy in order to turn this around. Independence for local communities should not come at the expense of invaluable support: There should be a focus on promoting leaders in communities that seek to enable others and support greater independence among residents. Having the right person to motivate, facilitate the exchange of ideas and guide people to the right kind of support is immensely valuable. Many thanks to all the roundtable participants, who included Big Local reps alongside representatives from Big Lottery Fund, The Conservation Volunteers, National Council for Voluntary Organisations, St Andrew's Community Network, London Borough of Southwark, Sheila McKechnie Foundation, Department for Communities and Local Government, University of Manchester and London School of Economics. We look forward to hosting future roundtable events and would be pleased to hear from anyone interested in proposing a topic. Debbie Ladds has written more on working with local volunteers in Charities Management magazine. Local Trust chair of trustees, Kevin Sugrue, sums up his reflections on the roundtable event in a blog for New Start magazine. The roundtable was held to coincide with publication of survey findings that show residents want a stronger voice in their communities.